As with Ten reasons why I'll unfollow you on Twitter, this post is based on my own observations of the blogging world. 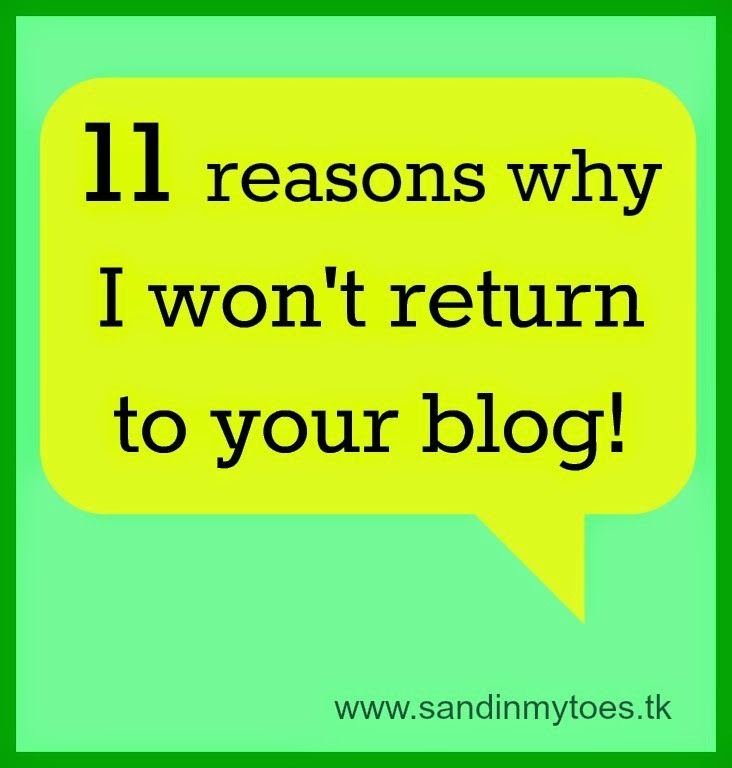 I'm sharing a few tips that could make a difference to whether a new visitor decides to return to your blog. Comments are very precious in the blogging world. So, make sure there aren't too many obstacles that visitors have to face to post a comment on your blog. For example, I fill in a form and decipher the Captcha image - only to be told that my comment will be visible after approval. The problem here is not with comment moderation, but with the extra security step involved if you're going to moderate it anyway. Don't make readers jump through hoops to comment for you! Experts also say that comments should be in the same page as your page (and not in a pop-up, for example. Sometimes I visit a blog with full intention of reading it, but I am hard pressed to find something to 'read'. It's great if you host a lot of blog hops and giveaways, but you really must focus on having some original content that invite visitors to interact with you. On the other extreme, some blogs lack images altogether. Pictures are so crucial to giving your post exposure. It's not hard to put up and really makes a difference between a visitor exploring or leaving your blog. If you don't have your own images, you can access any of the copyright-free photo websites on the web. Just make sure you give due credit! You must treat every post as if someone is reading it for the first time. If your post requires the reader to delve too much in your back story (without knowing where to go), they will just give up. Ways to avoid this is to give links to relevant posts and a complete About section. I really like the concept of introducing the people who you write about in your blog, for instance. I have nothing against long posts. But seriously, read what you've written before publishing it Sometimes, a post starts off great, then goes off tangent into something else, and then the whole point is lost. Remember, each post should have a point you're trying to make, and it should more or less stick to it. There are some awesome bloggers out there who write long posts so well that I can't stop reading them right until the end. Read and learn! It's lovely that you've spent so much time adding plugins and widgets to your blog. Just don't let it get in the way of your content. Everyone wants to be different, but there are some basic design rules that really make sense. Reverse text for example. Light text on a dark background can be difficult to read in a text-heavy blog. Choose your colours carefully. Ask for some feedback from friends. Likewise, choose your fonts carefully. Believe me, handwriting fonts look cool but are very hard to read. Play around with the right colour, font, font sizes and design elements until what you have is readable and attractive at the same time. You don't have to be minimalist but don't give the impression of clutter. Trim the bells and whistles! It is important for bloggers to be active on at least a few social media platforms. This is because even readers who like you may forget to come back if you don't remind them once in a while. Your wonderful writing can get lost if you don't share it. Sharing is everything!. I may overlook spelling and grammatical errors, but why would you give up on the punctuation? Not using full stops, commas and capitalization not only gives a shabby impression, it makes the text hard to read. If you want to be considered a serious blogger, you have to punctuate! It's as simple as that. And please don't publish posts in text language! The content itself should speak to your reader. Even if you are writing about something personal, make sure it doesn't look like you're talking only to yourself. Involve the reader in a conversation and promptthem to say something. Say I've come to your blog to read a fabulous post. Once I'm done reading and commenting, I should ideally be directed to something else. This is extremely important to get visitors to to subscribe to your newsletter or follow you. They won't do this easily. So, you must direct them to your best writings. This can be done with Popular Posts, Recent Posts or Related Posts. Whatever you choose - but it must be there, and it must be prominent. Money. Some bloggers look like they're almost a PR agency. They'll do anything to attract the moolah. There's nothing better than making money from blogging. But if you start a blog with the sole purpose of getting freebies and ads, your content is bound to suffer. And then the advertisers won't be interested anymore. Nor will the readers. I'm working on a follow-up to this post, and I'd like to know your blogging peeves! Come and tell me on my Google+ post below, and I'll share the best on my blog. I am with you on the Captcha code followed by approval. What's the point of putting in the code if comments are being moderated anyway? On the topic of punctuation, I am also annoyed by type that is all centered rather than flush left. It doesn't look professional at all. It looks like a fourth-grader's poem. I'm always working to improve my content. These are great tips to keep in mind. Thanks! Good point about the alignment. Thanks for sharing your thoughts! Thanks! I enjoyed this post. Full of helpful advice! Absolutely, that's an unwritten rule - and one that I always try to abide by! We bloggers must stand by each other! Awesome awesome points! I do a lot of blog hops, but I always leave relevent comments on people's posts. I however will turn around and walk away from a blog that seems disorderly or like there is no real person behind it, or like you said having to jump thru too many hoops. Great post, and I'm stopping by from the weekend showcase! GREAT ideas. You hit on all the reasons I don't return to many blogs from poor grammar/punctuation to poor writing and poor design. My personal pet peeve: the post that starts with an apology for why they couldn't post. Don't care. Just leap in with the story. Good points all. Glad I found you through the comments on A Mother Life! -- Norine of Science of Parenthood. Hopefully, you'll like -- and return to -- my blog! Worth the read. Thanks for the tips! I hate, hate, hate Captcha code. Come on, if you're afraid of spammers, just use a decent spam filter. Then check your comments every now and again and boot out anything that slip through. It's my pet peeve! Blogger does a good job of separating my spam though. When I first started my blog, it required Captcha code for comments. Fortunately, within the first week, someone took the time to let me know that it can be annoying. Especially, when using a tablet. I removed it immediately and have had very little spam problems. You have provided some great tips and ideas I plan to incorporate on my blog. I'm glad you liked my tips, thanks for stopping by! Great post! I always try to comment back when someone comments to me...it's just the nice thing to do! Plus you meet all sorts of great people that way. I won't say I have never missed, but I do my best! I also respond back...nothing drives me crazier than people who never respond. I really dislike Captcha and when you have to log in to comment. If I have to log in, forget it...I'm not commenting. Captcha, I will comment, but I won't be visiting those blogs all that often unless I really love them. I'm with you! I always try to comment back. Glad you liked my post! Came across this post on Twitter. As a long-time writer, but new blogger, this post gave me some practical tips on how to get a solid start with my new site. Thanks so much and I look forward to looking around your blog more! Great information! As a new blogger I am looking for all the tips I can get! I wholeheartedly agree with the point about distracting design. I like a clean look and have tried to stay true to that on my blog. I have visited a few that turn me in circles and I will usually end up throwing in the towel! I comment/visit/follow back as well. This seems to be especially important and it's just good manners! I think I'm keeping up fairly well. If I can't get to one today, I keep a list to follow up with the next day and that seems to be working. Thanks so much for the post! Thank you and looking forward to having you back! Always a good idea to keep in touch with your readers! Thanks for stopping by. I agree with pretty much everything you've included here. I still have a hard time with grammar and misspellings though. I try, TRY, to let it go because no one is perfect and I've gone back to correct my own published posts but it's still just one of the things I think should be double and triple checked. I guess I am a little obsessed with spellings and grammar, but on the internet, it's okay to let a few things go! Thanks, I found this really helpful. Agree with Jessica about people apologising for not writing lately! Happy new year! So glad you found this helpful. Hope you have a happy new year too! Yep, totally agree with all of these!! Ooooh. Some more good ones!! Gosh, I'm off to go check out my blog and see what I am doing on this list!!! Yep too true - especially the sponsored posts. It does indeed seem to take time and practice to get the blog format right. I can't find a related posts feature on blogger, for example, so I do them by hand whenever I have a chance. I think one issue, at least for me, is blogging while caring for a child full time. I have nap time in which to write and edit. I think a lot of these problems would go away if there weren't so much overlap between bloggers and people who have young children! There are many great tips here in this post, I am looking forward to applying them to my blog!